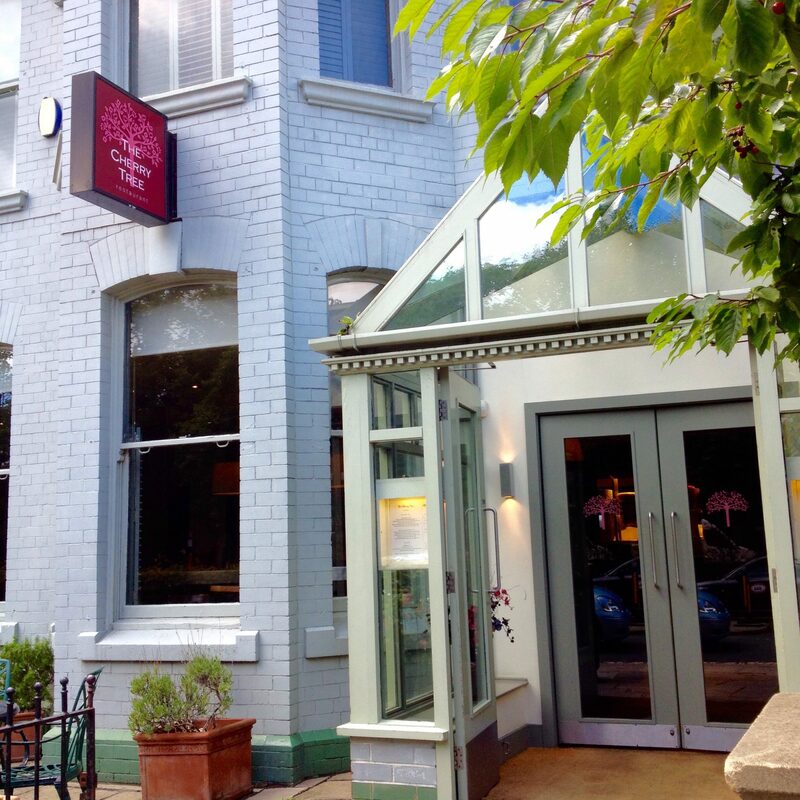 Summer is here, and whilst the weather isn’t playing ball luckily you can visit a restaurant like The Cherry Tree in Jesmond and be instantly transported to a Mediterranean terrace, chilled drink in hand…. That’s what the Mr, LD and I thought anyway when we headed past the actual Cherry Tree that greets you as you leave Osborne road and walk through the doors of this delightful restaurant. It is deceptively large, but still feels intimate with a spiral staircase leading up to a mezzanine level. The bottom floor’s focus is a grand piano, with live music nights on Wednesdays and weekends adding a lovely ambience to proceedings. Even without music the place has a great stylish and relaxed vibe. We visited on a Thursday afternoon to check out the set lunch menu. For £14 for two courses or £17.50 for 3 (£17/£20.50 for dinner), it’s great value and rivals neighbouring city centre NE1 Restaurant Week offerings. Of course LD made friends instantly with the couple at the table next to us, as well as our waitress (told you he was a ladies man!) while we perused the menu. Having gleaned from manager Steve Burke that the relatively new head chef Paul Hesson trained under Jamie Oliver and he and sous chef Scott Teague are both ex Cafe 21 (which we visited on our anniversary last month, read about it here) we were pretty psyched to see what they had in store for us. After we told them that the Mr is lactose intolerant Steve very helpfully spoke to chef and came back with an adapted menu of what he could have and what could be tweaked to suit him. This went down very well with the Mr who settled on homemade pork and apricot terrine, pickled shallot, cheddar and hickory (minus the cheddar). 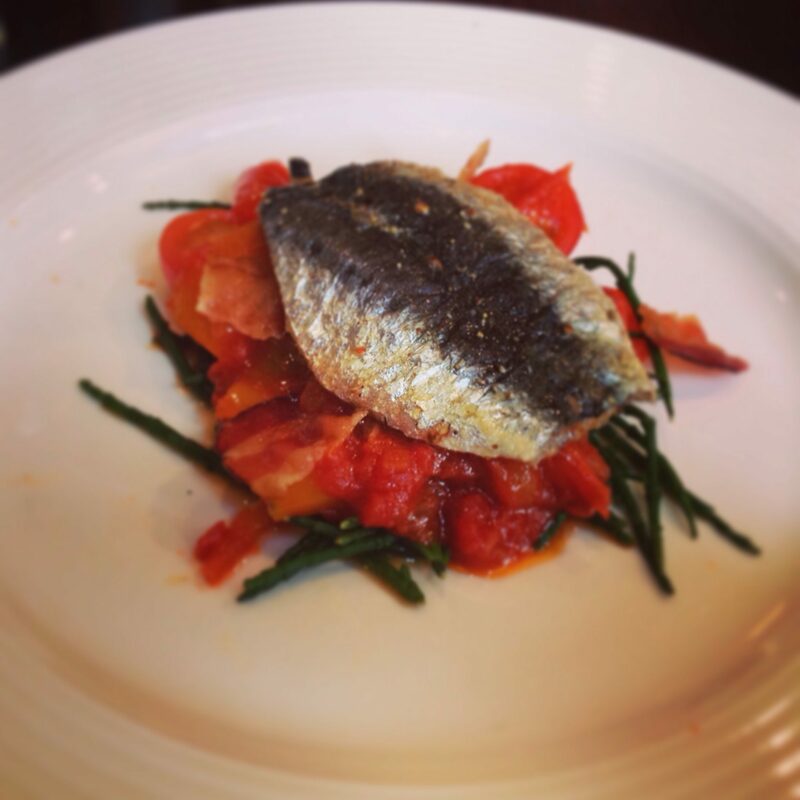 I went for the grilled sardines, bacon, tomato and samphire salad. The starters arrived promptly looking almost too good to eat – note the use of the word almost! The terrine came with a wedge of cheddar which the Mr swiftly moved onto my plate, but it was no biggy – LD and I shared it! The lightly grilled fresh sardine was complemented by roasted tomatoes and peppers, with a salty kick coming from the bacon (what doesn’t benefit from a bit of bacon?) and some lovely samphire. The last time we had samphire was in Holland, and we actually picked some of our own from the North Sea! It’s been a bit of a summer of samphire, I keep seeing it on menus wherever we go and the veg man at Borough market had loads of it too. Lovely stuff. The Mr’s terrine was the ‘most meaty’ terrine he’d ever tasted, which is a big plus in his book. He even preferred it to the excellent terrine we had at the Bridge Tavern, which is really saying something. I had a bite and it was delicious, none of the gelatine ‘slimy bits’ you sometimes get in terrine. 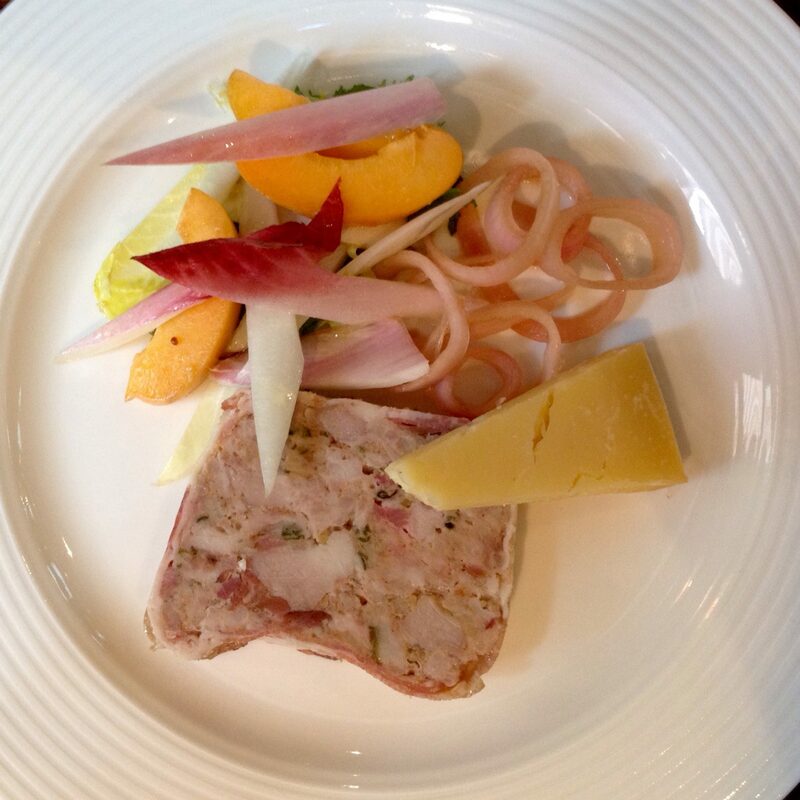 Lovely pickled onion slivers and apricot segments brought out the flavour of the pork. We asked for some bread to go with it, which to be honest it didn’t really need but perhaps a slice of toasted sourdough would’ve been a nice accompaniment. LD happily gnawed on some french bread and made eyes at the ladies on the next table while we waited for our main course. 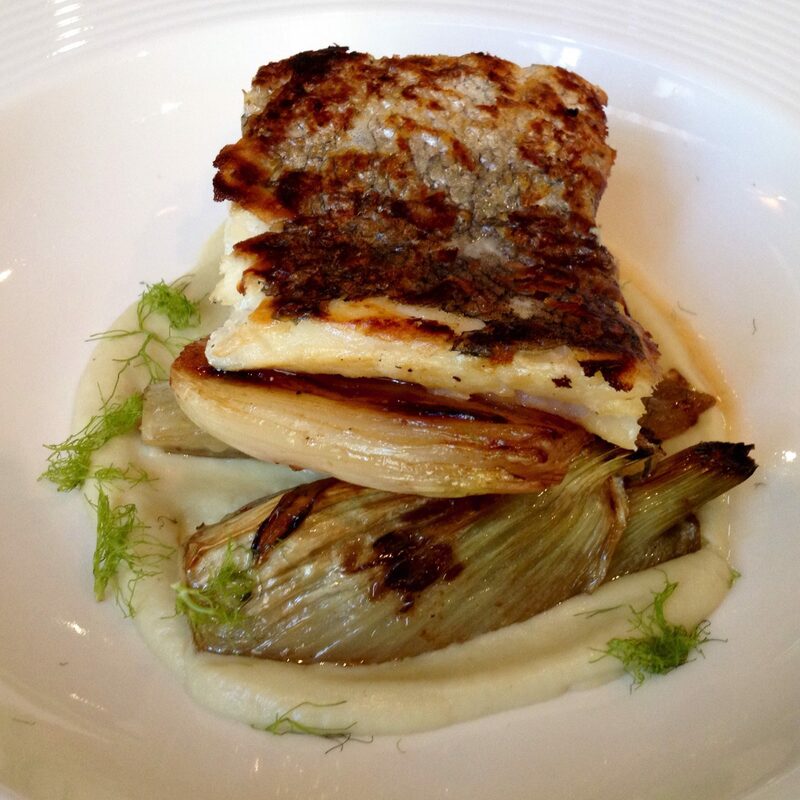 I had gone for more fish – Smoked hake, fennel, roast shallot and turnip fondant. 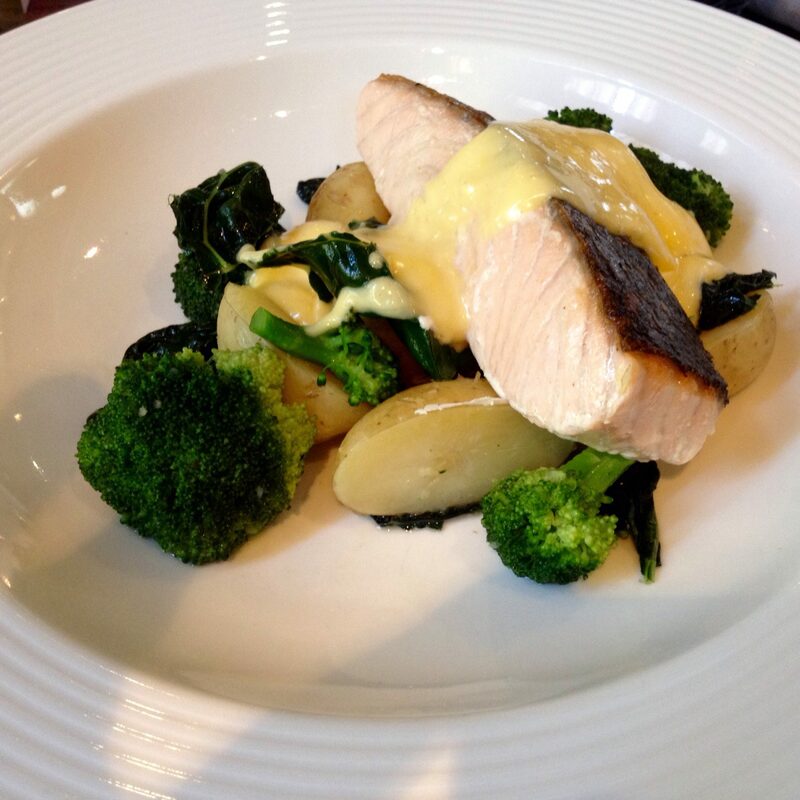 The Mr went for poached salmon, new potatoes, broccoli, cabbage, basil and a lemon hollandaise. I don’t know if I’ve ever knowingly eaten hake before, but I’m definitely going to from now on! Flaky, succulent white fish with a delightful smokiness and crispy skin, the subtle flavour of the accompanying veg and creamy sauce working perfectly together. The Mr was happy with his salmon and veg, which he said was “simple, wholesome food done well.” That is what this bistro centres on; locally sourced high quality ingredients and a no-nonsense approach to cooking it, letting the quality of the food do the talking. These guys know their stuff. To end our gastronomic mini-break I had a limoncello tiramisu with blackcurrant compote and the Mr had Cherry Tree bakewell with cherry sorbet. It may not sound like much but this was a rare treat, as the Mr can’t usually have a dessert due to the dairy that’s normally lurking in some shape or form. The desserts arrived looking beautiful, and after taking a quick snap we tucked in. My lemony pudding was not what I was expecting, as it was nothing like a standard, coffee-soaked tiramisu – but lovely none the less! the blackcurrant compote cut through the creamy sweetness and made me feel a bit healthier (it’s a total superfood, don’cha know) The Mr heartily tucked in to his bakewell, trying to avoid LD grabbing his spoon as he was by now getting bored and sitting on his Daddy’s knee. 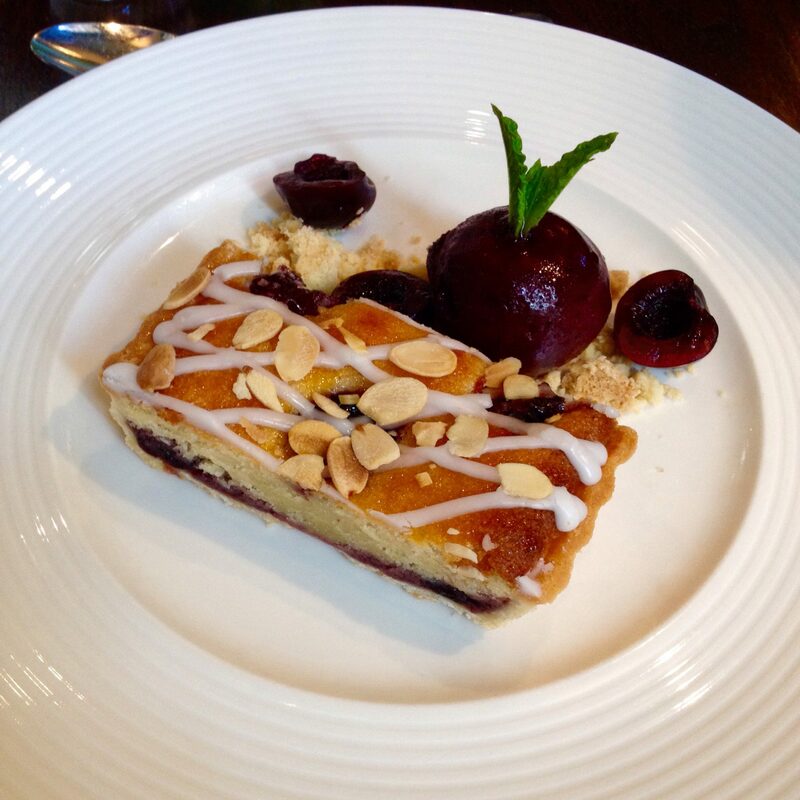 “Do you think the cherries in the bakewell are actually from the cherry tree outside?” I asked the Mr. He was doubtful as the ones outside were still pretty small, but you never know! We left feeling pleasantly full, like we’d eaten the perfect amount of good quality, wholesome food. No food guilt for us! 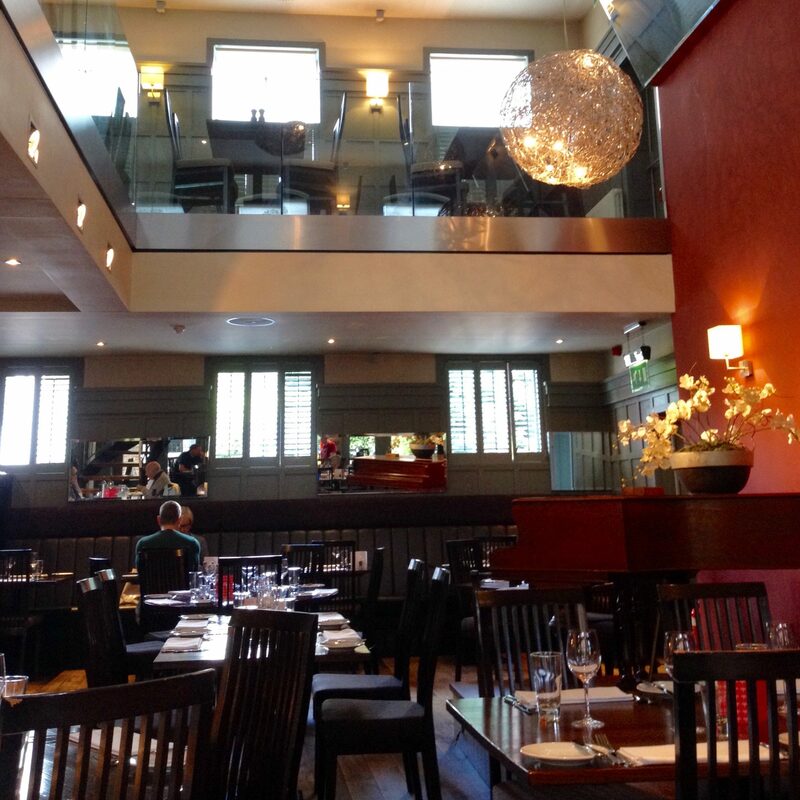 We couldn’t fault the service, ambience and food in The Cherry Tree and we will be back. Great value for money if you’re looking for a delightfully Mediterranean lunch (or dinner) just outside the Toon! 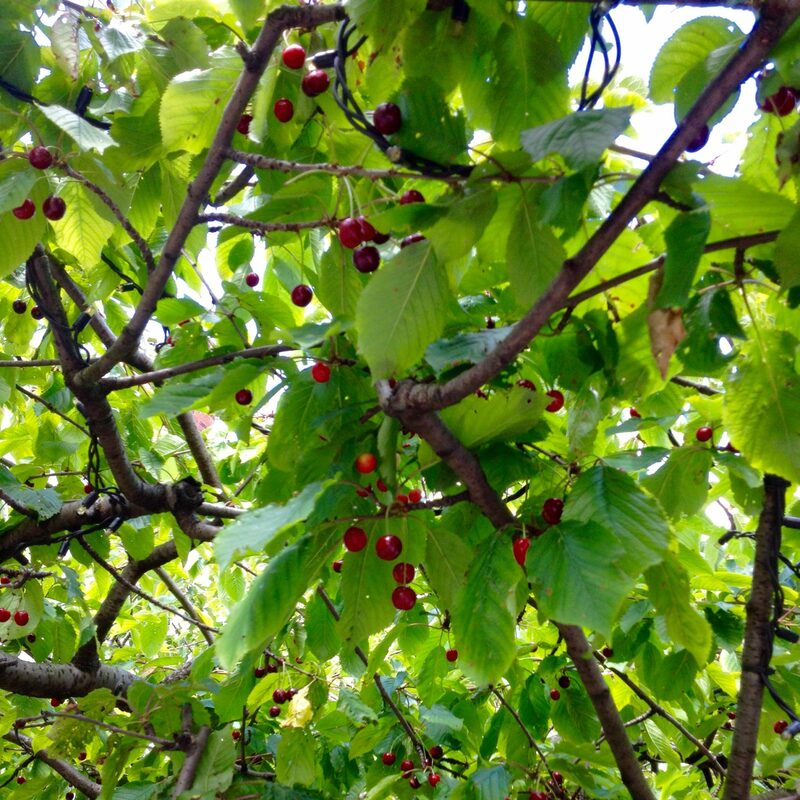 Have you been to The Cherry Tree? Let me know your thoughts. 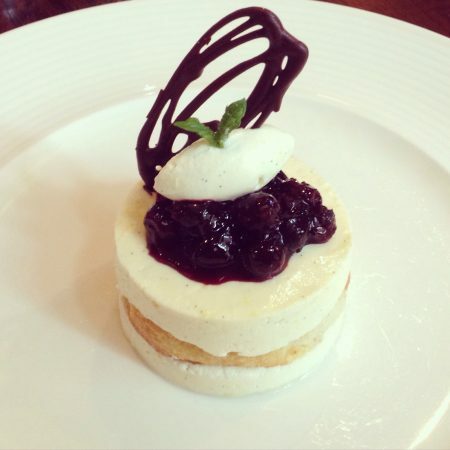 Follow me on Twitter and Instagram to keep up to date on my foodie musings.